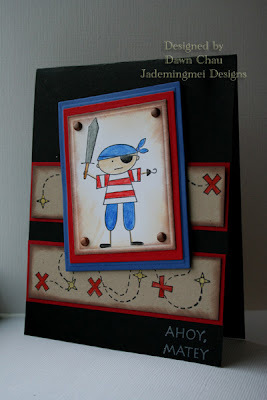 I finally got around to purchasing this cute little pirate set:) It's nice to play with some "boy-themed" cards and lay off the pink...lol This little guy reminds me of Nephew Aidan...he's going to keep his Mommy busy! I kept the layout pretty simple and used my nestibility dies for the focal image. The pirate is stamped on and colored with SU! re-inkers...these seem to be my favorite medium lately as they blend very nicely. The only extras I added were the MM vintage brads and some Crystal Effects on the sword, eye patch, and hook for a 3-D effect!